I'm developing new integrated hacking tool for DKC2, "Super Gorilla Maker 2." Notice:This is a developing version, not a stable release. So there are remained some bugs and issues. In addition, some features haven't been implemented yet. I hope you make wonderful works with this editor. This is exciting. I look forward to the sprite editor option! It seems that your screenshots doesn't work can you fix it? Will the SGM2 allow for importing PNG files to a level, like how DKCRE does it? Currently, SGM2 does not have plans to supporting media file or image file. So it is so difficult to completely compatible importing GFX data from image file. In addition, it'll take so much coding cost and may cause big amount of bugs but will not improve so much convenience. For these reasons, SGM2 will not support image file. SNES GFX data don't have any color data. SNES needs GFX data and color palette data to create image data. SNES GFX data only have index of color of each pixel, and can use 16 colors. But general image file, like BMP etc... have color data. SNES only can use RGB555 color, but general image can use RGB888 or RGBA8888. These difference make it hard to import image file. I can't wait for this! However, I am a skeptical person, so allow me to inquire about a few things before I believe this to be real... jk I just want to know a few things. 1. Why have you waited so long to showcase this? Only one week before the release? 2. I assume that like all other DKC editors you cannot edit the number of enemies per level, but meh, let me ask. Can you edit the number of enemies per level? 3. What is the "charge editor"? Just want to ask. Anyways, I can't wait for the release! 1.All of coding and ROM analysis has been done by only one person (me), so development period is unpredictable. This is main reason. 2.Yes. However, if you increase the number of sprites, please specify a different address before saving. Not limited to the sprite, this editor does not provide size check in order to allow flexible data editing. Therefore, you need to be careful to data size. If the data is larger than the original, when you save without changing its address, subsequent data will be corrupted. Number of levels contained each world is not expandable with this tool. But if you have skill to hex editing, it may be possible. I'm considering to provide size check and world map expansion. They may be added to June Beta Test. If possible, I'll add size check to May Beta Test. SGM2 September beta test was released! What version of the rom does this require? I tested with (USA) (En,Fr) and it did not work. Do I need (J)? SGM2 initial setting is for NTSC-J. Before loading ROM, press Alt+U for NTSC-U or Alt+E for PAL-E. This is unusable I can't read anything. English translation? 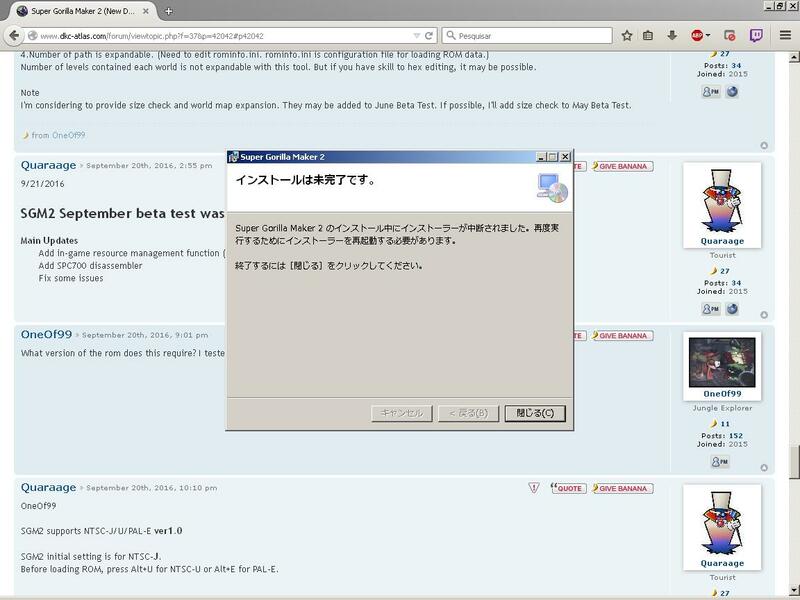 If SGM2 UI isn't translated automatically, you need set UI language manually. I checked the boxes for english and restarted the program but it didn't work. Help apreciated looks really prommising. I am eager to try your program out but I cant get it it set to English. This looks amazing! I might have to play around with it unless it isn't in English yet. Wow. This has insane potential! Haven't tried it yet, but especially the Sprite Editor looks amazing. Is there any chance for automatic tile parsing for sprites? Like, you could import a sprite and it would auto-calculate the optimal tile size and tile count and re-arrange them to take as little space as possible in VRAM? please get the english translation working, I really want to to use it. Cyclone wrote: please get the english translation working, I really want to to use it. It does not translate to english when I choose the option. I really want to try this, specially the sprite editor. Ah... I'll fix this issue for next release. Thank you! -Add CTRL+Z to revert a movement like moving a sprite. -Add more images for sprites! I don't like staring at red letters with numbers. -When the level tilemap is changed, you get a unhandled exception and it says that you have to close the program. -Opening the text editor from menu or CTRL+T causes a unhandled exception. Great program, by the way, This has a lot of potential! 1,2,3 → I'll try them. 4 → Sometimes, region code in ROM is tampered. So SGM2 cannot use it to judge its "real" region. 5 → Undo/Redo will be implemented in the next major update. 6 → I'd like to make them such, but some sprites don't use any images or common animation, so it is hard. Cannon barrels don't use common animation, but fortunately, I found their animation data in their ASM code. In the next major update, cannon barrels will be shown with their images. What method/script will you be using to implement Undo/Redo? That is one of the most difficult features to program, as far as I know. Quaraage wrote: \6 → I'd like to make them such, but some sprites don't use any images or common animation, so it is hard. Ah, can you also include the "Mapchips" for DKC 2 next update?, Couldn't find them anywhere. SGM2 January beta test was released! This is a minor update. Fix the issue that user setting aren't applied without administrator mode. Some sprites including cannon barrels are shown with their images. Currently, I am developing RC version. why isn't level ISD working? It just crashes the tool. SGM2 Jan Beta Test Hotfix (SGM2 Ver0.7.2) is now available.